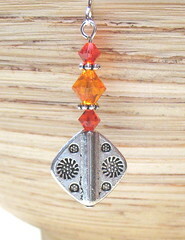 *Making more jewelry (like the lovely starburst earrings pictured in this post). *Adding all the new jewelry to our inventory program, photographing it, and listing it. *Listing our fabulous Fall themed photo cards in all three shops. *Setting up an ArtFire kiosk on our brand new Facebook Fan Page. *Ordering a new design for our business cards and labels, by the wonderful Thompson Designs. They are going to have the same awesome design as all of our shop banners. *Ordering mailing envelopes, jewelry boxes, earrings displays, and gift bags. There are still lots more new products to come, including our Halloween photo cards. Plus, be on the lookout for the announcement of our first ever sale!